Few characters have been through as many retcons as Moon Knight. Let's take a look at some of them, shall we? A vision in an Egyptian temple leads Marc Spector to don a silver shroud and become the crime-fighting hero, Moon Knight. Right off the bat, we're looking at a retcon: that info, as presented in the text on the back of the packaging (packaging which, it should be noted, features a Moon Knight symbol on the top rather than the Spider-Man symbol the rest of the figures have, and Moon Knight's logo on the front), is Moon Knight's second origin; at first, he was just a mercenary who was hired and given a costume/name by The Committee, a group that wanted to get rid of Werewolf by Night. He thought the name was dumb, but they were writing the checks, so he just went with it. When he realized The Committee were the actual bad guys in this scenario, he quit and took the costume with him. The next time he appeared, he was no longer just an ex-heavyweight boxer, and instead had super strength that waxed and waned with the moon, credited to minor exposure to werewolf saliva. Retcon #1! 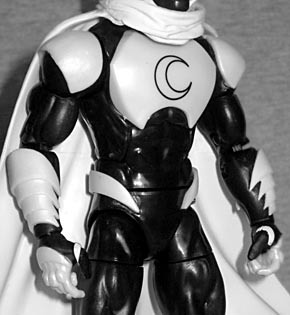 This figure represents Moon Knight's Marvel NOW! costume, which is a fine choice - it really is a great design, walking the line perfectly between "protective armor" and "flexible suit." 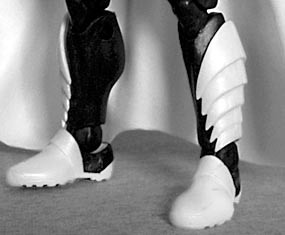 Though coloring techniques led to a lot of confusion, his original costume had a white cape, black shirt, and black pants with white stripes down the outsides of the legs. This one goes back to that colorscheme, rather than the all-white/all-silver he's donned so often over the years. He keeps the hooded cape, Moon Knight's constant visual signifier, though it also adds a wrinkled collar. The largest piece of armor is a plate on his chest, painted with the outline of a crescent moon, and he has smaller pieces on his shoulders, forearms, hands, waist, and shins. His gloves have studded knuckles, to really add some power to his punches. When Moon Knight got his own series, he got the new "Khonshu brought me back to life" origin - that one said he'd already been acting as Moon Knight before being hired by The Committee, and only agreed so he could bring them down from within. Retcon #2! This was also when the multiple personalities came in. Eventually his moon-strength was dropped, too. The last time we got a Moon Knight figure, it was ToyBiz using the Bullseye body. 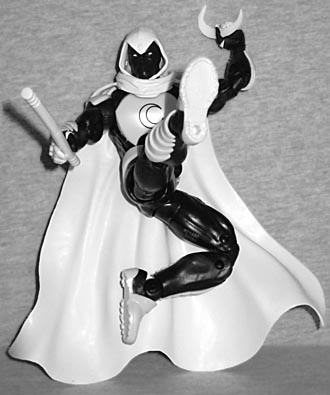 Someone at Hasbro must love Moon Knight, though, because this figure is entirely new molds. And more than that, all the armor is done as separate pieces that plug into the body! Was molding them this way cheaper than trying to paint them accurately? It must have been. There's a clear difference between the parts that are molded in white and the parts that are painted - the unpainted plastic has a certain translucence to it, whereas the paint stops light right at the surface - and the pieces do rattle a little bit, rather than being a tight, seamless fit. Still, it makes the toy look really nice, and the fact that all his armor is done in crescent shapes is terrific design work by Ron Ackins. After retiring for about a minute, Moon Knight came back with mystic weapons to fight mystical enemies. Retcon #3 unlocked! He joined the Avengers, exorcised Khonshu from his mind, and retired again. The only spot of color on this figure can be found in the eyes - they're a pale blue, not the white they appear at first glance. His mask is black, which is traditional: even at times when Moon Knight wore a light mask, his head was always drawn in such perpetual shadow that it would often be solid black inside his hood. Retcon speed round! Un-retiring, Moon Knight went back to fighting street crime with no powers. He founded an anti-crime think tank. The multiple personalities came back. He was descended from a demon. He got super sick and had to wear armor. He got healthy, but died in an explosion. His body was positively identified and definitively buried. He came back to life again, but maybe he'd only been hallucinating Khonshu the whole time. His headquarters were destroyed, so he retired. At some point he came back and retired again, entirely off-panel. You count how many that is, we're not sure what's what any more. ...there are notches in his fists where the tiny blades fit! Oh my god, how cool is that? They don't fit in very far, but you can pick whether you want them to point up (for throwing) or down (for cutting people up like Wolverine). Dang, there's a reason this toy was nominated for Toy of the Year! Back to the character history. Active again, he got super violent and unhinged, and ended up throwing an enemy off a roof in front of a crowd. So he faked his death and retired. That didn't last long, and soon he was back on patrol, though not (quite) as violent as before. He joined his second Avengers team, worked as a spy, and used a dart gun that gave people nightmares. The toy has all the usual articulation that makes Marvel Legends consistently the top-of-the-line in the (western) toy industry: a balljointed head, hinged neck, swivel/hinge shoulders, swivel biceps, double-hinged elbows, swivel/hinged wrists, hinged torso, swivel waist, balljointed hips, swivel thighs, double-hinged knees, and swivel/hinge rocker ankles. You may notice the lack of swivels in the shins, but worry not! That range of motion is covered by the extra swivel at the top of the ankle. Despite all the add-on armor, none of it gets in the way of the movement. Impressive! 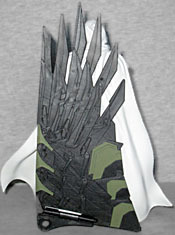 And there's a hole in his back where the cape plugs in, so it won't be flopping around when you pose him. Moving to California, Marc Spector produced a TV show based on his own life, while his dissassociative identity disorder began manifesting as versions of Spider-Man, Wolverine, Captain America, and Iron Man. 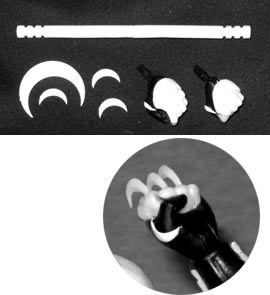 As part of the Spider-Man: Homecoming series, Moon Knight comes with a piece of Vulture's wings as his Build-A-Figure part. He gets the outer section of the left wing - remember, the greener side faces forward, for some reason. Moving back to New York, Moon Knight learns that his "multiple personalities" are related to the four aspects of Khonshu, because he really did die back in the desert, and the god had to bond with his mind in order to heal the brain damage that had caused; that knowledge didn't keep him from developing a second superheroic personality, "Mr. Knight," who wore white suits and consulted with the NYPD. So that's the story of Moon Knight. Or rather, those are the stories of Moon Knight, the hero where everything you know is wrong! It's probably been changed since I started writing this review. It's probably changed since you started reading it. But no matter what, this is an awesome design executed really well.